When Catherine Ducane disappears in the heart of New Orleans, the local cops react rapidly – she is the daughter of the Governor of Louisiana after all. But the case gets very strange, very quickly. Her bodyguard turns up horribly mutilated in the trunk of a beautiful vintage car and when her kidnapper calls he doesn’t want money: he wants time alone with a minor functionary from a Washington-based organised crime task force. A QUIET VENDETTA is both the epic novel of one man’s life in the Italian Mafia – a story that ranges from Cuba to Las Vegas and from L.A. to Chicago – and equally a powerful thriller of rage, love and loss. It confirms Roger Jon Ellory’s place at the forefront of new thriller writing. RJ Ellory has been an acclaimed author for some time in his native England, and is lesser known here in the states even though he always uses U. S. settings. Starting with the stunning A Quiet Belief In Angels and the shadow history-serial killer hybrid A Simple Act Of Violence, his work has started to come over here. 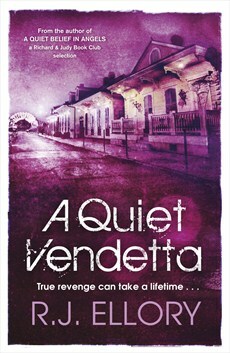 The latest Ellory book to hit our shores, A Quiet Vendetta, solidifies him as one of the top crime writers today. Read all your other books and each one has a special twist at the end, so unexpected and exciting, i could hardly read the words in front of me. surge of non-confidence in yourself and your production of enormous talent. I hope to be reading more if your wonderful books that you write so well, well enough to grip my attention snd impatient to read more that you produce. Good luck and best wishes to you. Keep going, i long for the next book. Ah well, that is a long story, Lola, and the reports that found their way into the newspapers and the reality of what actually took place could not have been more different. However, it was a very, very unpleasant time in my life that is now more than three years behind me, and it really belongs in the past. I am thrilled that you’ve enjoyed the books you’ve read, and I really hope you continue to enjoy them long into the future! Thank you for your very kind words. Your support and encouragement are hugely appreciated.